Apparently this post has been much anticipated, so I hope it can live up to the expectations. Obviously, I mentioned several times that we traveled with Kenley a couple weeks ago. Growing up, we didn’t travel much by plane. Our family drove everywhere. We had a great van(s) with the works, so we were able to stretch out and get comfy. Greg, on the other hand, had been flying since he was a kid. Once we moved to Florida though, we became frequent flyers. with everything packed nicely in our carry-on luggage, grabbing a beer, and boarding our flight. They’ve even changed since Kenley’s first flight. which turned out to be a great purchase and very convenient. so we have two free hands to deal with a squirmy child, if need be. The flights were only two hours each way and they were a challenge. it was a struggle on our part to keep her occupied in the small space we had available. I wasn’t going to move it for the life of me. Let’s go back to rule #1…never wake a sleeping baby. 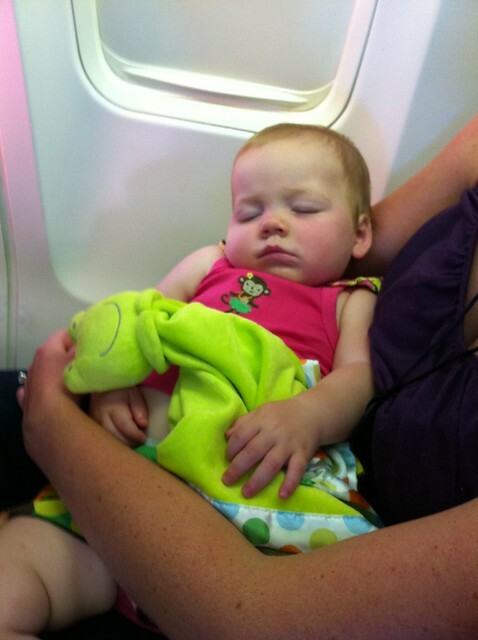 The flight attendants, on the other hand, couldn’t care less that we had a sleeping baby on our hands. They were the first to let us know we were at cruising altitude and we were free to use our portable electronics. While she was awake, it was an reenactment of a WWF wrestling match. Kenley was up and down, then would crawl over to Greg, then back to me. then ended up on the floor every time we gave them to her. Then that turned into a game in itself. We had a snack and some puffs to pass the time. putting his hand through the seat when he heard Kenley get fussy. She loved it and it distracted her for a short bit. Greg occupied another five minutes by clicking the reading light on and off… on and off. She was enthralled by it. It’s the little things I guess. Like I said, she really was good on both flights, but it was exhausting. which, in turn, makes me stress out more about Greg than Kenley. I kid you not, once we were back in the Orlando airport, I said to Greg that we are not having any more kids. Obviously, the moment has passed and we can laugh about it now and needless to say, we were ready to get home. We were very fortunate that my parents had an infant car seat, which means we didn’t have to bring one. to get back to my parents’ house. I used this time to feed her a snack to pass the time. It was nice to always have someone in the back seat with her to help keep her entertained. We didn’t travel very far once we arrived at our destination, so the next long trip was back to the airport to go home. We took advantage of the fact that we were going to be on vacation and opted to use disposable diapers. It was one less thing to worry about and much less to pack in our suitcase. It was nice and a good break from diaper laundry, but it didn’t change our mind about using cloth back home. We also decided to get jars and pouches of baby food. These Boon spoons were clutch all week when we were on the go. They attach directly to the food pouch. but knew that it would be silly to do that on vacation. Again, a nice little break for us. We tried to stay our normal schedule as much as we could, but we knew we were going to be flexible. The first night Kenley was up about two hours past her bedtime and we honestly didn’t even mind. It was a special occasion and we were cognoscente of the fact that people wanted to see her. she ended up taking an extra nap every day while we were there, which was fine with us. Of course, we were bound to forget something. 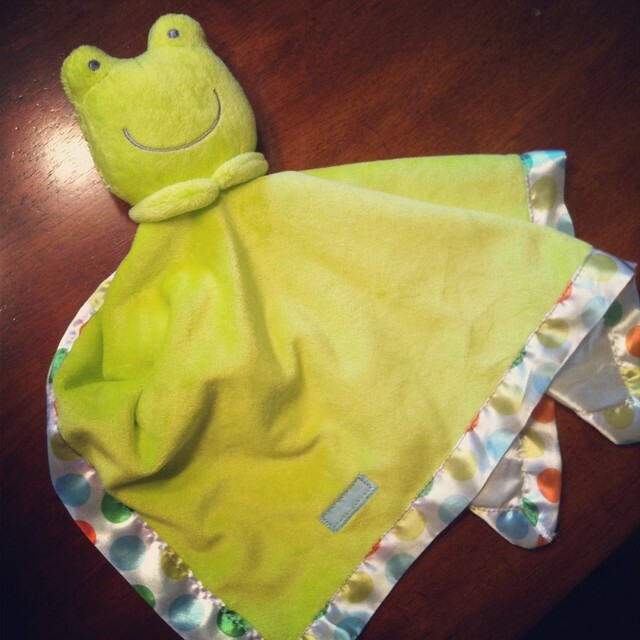 Unfortunately, it was Kenley’s lovies that she sleeps with every night. so I preformed some surgery on the little guy, opening him up, removing the silly noise maker, and sewing him back together. He worked out great all week for her cuddling needs and now acts as a back-up at home. 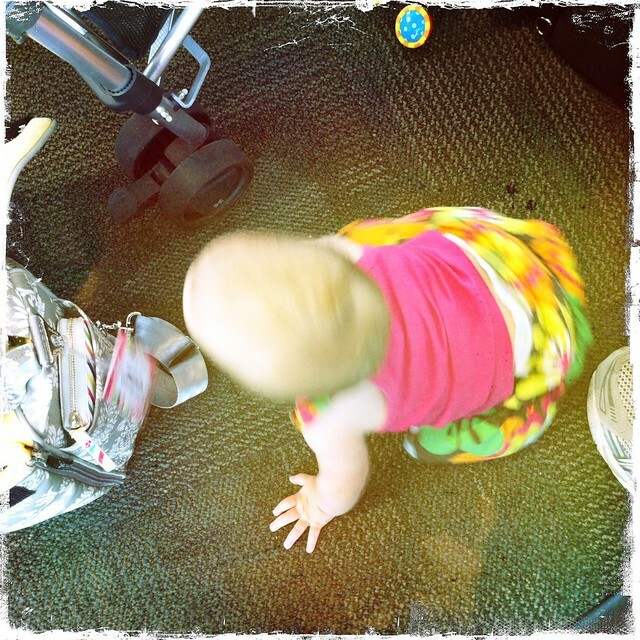 we let her crawl all over the dirty airport floor. When push comes to shove, you realize it’s not the end of the world. Whatever it takes to keep your sanity. So, there you have it, our travel experience with an (almost) 9 month old. 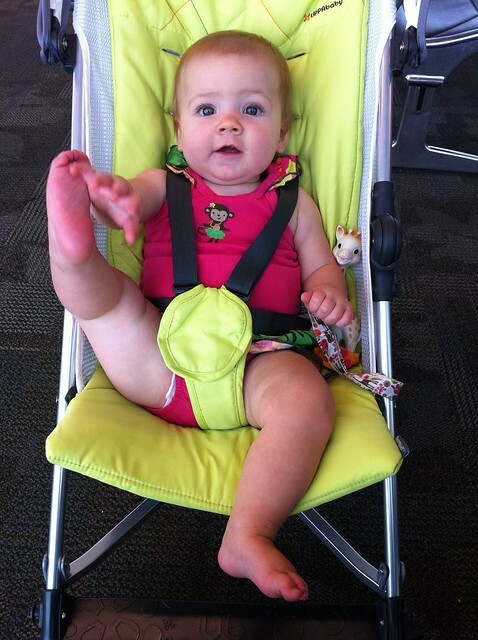 Do you have any tips for traveling with a tot?